If you’ve never been at an event in the Great Auditorium in Ocean Grove, you need to add this to your “Beach Blanket List”. Unlike like the “Bucket List”, you’ll want to do this as many times as possible. Ocean Grove is a lovely area just south of Asbury Park, offering a few quint restaurants and shops, and an easy stroll on the newly post Sandy reconstructed boardwalk. And of course, one must stop at Nagles for an ice cream treat. Whichever way it’s pronounced, it should mean “a nice quiet place to get away to” just for relaxation, watching the birds and fishers. However, if you want to and the serenity, ask a local if it is in the Borough or Township. Open daily, for free if you help keep it clean and follow a few modest rules. 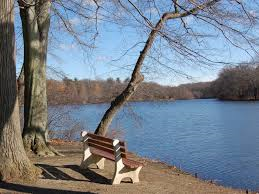 Lake Topanemus Park is a 71-acre site with abundant natural beauty. The park has been a long time favorite spot for those who like to fish, jog, bike, boat, picnic, walk, and bird watch. Many folks just use the park to relax in a tranquil setting full of trees, flowers and wildlife. The care of the park is overseen by the Lake Topanemus Park Commission.